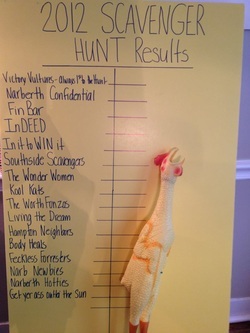 Narberth Confidential took the overall points prize, sealing the victory on the strength of a dramatic dash to claim the elusive rubber chicken. The contest was not without controversy, however, as one disgruntled 2nd-place finisher swears to have witnessed Confidential team members sipping Red Bull instead of the traditional pre-race lagers in the Rickards back yard. An investigation is pending. Have some photos to share? E-mail them to Cyndi.